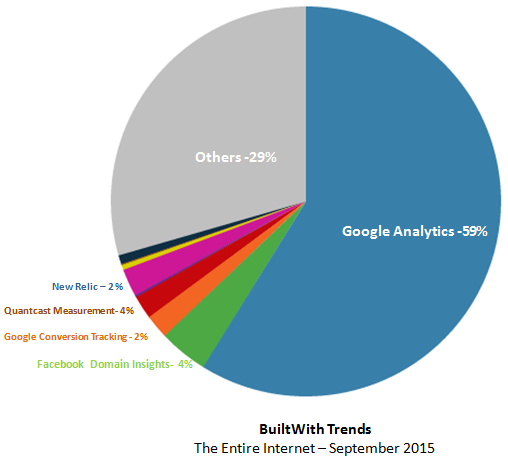 According to BuildWith Trends data as on 2015 September, Google Analytics is being used in 59% of the total websites across the globe.We can understand its importance from the fact that the following web analytics platforms; Quantcast Measurement and Facebook Domain Insights, are only used by 4% of the users.There’s no doubt that Google Analytics is one of the most preferred web analytics platform used by businesses and service providers in Dubai, just as in other cities within UAE. It has become a de facto standard to track the online performance and gain meaningful insights about a website’s performance. The traditional GA code or the Synchronous GA code had ga.js and PageTracker component in it. In 2007, Google recommended placing the GA code just before the closing </body> tag in the HTML source code. 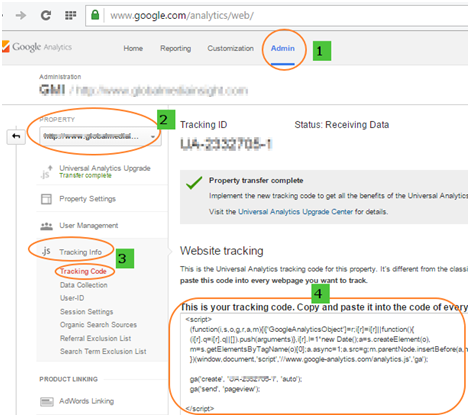 So it’s only when the entire content in a webpage gets loaded that the Google GA code gets executed and the analytics interface records the visitor data. The Asynchronous Analytics Code was introduced by Google in 2009. The two unique components in this version were _gaq.push and ga.js. From the Asynchronous Analytics version, Google recommended placing the GA code just before the closing </head> tag. So whenever a webpage gets loaded, the GA script placed at the top executes itself and collects the data back to its respective website’s database. A few of the benefits of the this version when compared to its previous versions of the GA Code would be its faster loading time and better accuracy in data collection. The Google Analytics with Display Advertising Code was introduced by Google in December 2012. The updated GA code had improved features for Remarketing which became helpful for better targeting of Display ads. Also, the Enhanced Link Attribution feature that was introduced in this version offered improved visualisation of clicks in the In-Page Analytics Reports. 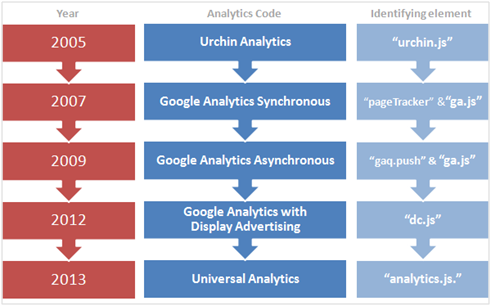 The Universal Analytics Code was introduced by Google in 2013. It uses the ‘analytics.js’ script in its code. When compared to the previous version, the Universal Analytics has way more options to track signed-in users, advanced visitor segment creation, custom dimension creation etc. The Universal Analytics code offers more precise visitor tracking data since it eliminates duplication arising from the same user who has logged in from multiple devices at a time. How to check if GA Code is used in your website? Open the source code of the website and check the GA code (You can right click on the webpage and select the “View Page Source” option or, you can use the shortcut key ‘Ctrl+U’ to open the website’s source code). For example, search for the term “ua-” in our website source code. You will find a unique Google Analytics Tracking ID which is placed in our webpage to track the visitors to our official website. You can refer the main GA Code History image above to know the GA Code version which you are using in your website. If your website was launched before 2009, there is a chance that you would be using the old GA code in your website. During our SEO Website Audits, we have witnessed a recurring pattern where most of the old websites tend to retain the old Google Analytics code in spite of creating new responsive websites. Where to get the latest Analytics Code in Google Analytics? In case you’re unsure about where to collect the latest GA Code, refer the image below. Log in to your Analytics account from the URL https://www.google.com/analytics/ with your credentials. Is your website’s GA Code version up-to-date? Web Analytics consultation, feel free to contact us. Our Google Analytics certified team will ensure that you receive in depth data insights and all your web analytics objectives are met. Call us or drop us a line so that we can discuss your requirements and help you in making your online business goals a reality.